The Sebastians have a variety of touring programs available (below) or can create a new program for your venue, series, or special event. Contact us to start a conversation about bringing the Sebastians to you! Click here for our complete Press Kit including images, press quotes, concert bio and more. 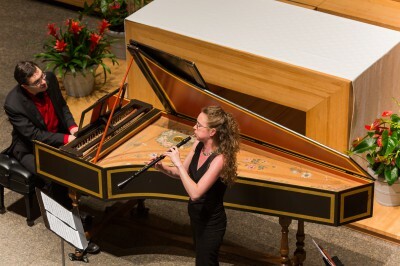 This program travels north from Italy and explores the emergence of the instrumental styles of 17th-century Italy and the adaptation of the Italian styles in 18th-century Austro-Germany, featuring works by Bach, Biber, Corelli, Fontana, Froberger, Handel, Telemann, and Vivaldi. Celebrating their namesake, the Sebastians perform trio sonatas by J.S. Bach, Handel, Buxtehude, Rosenmüller, Erlebach, and Telemann. The Sebastians demonstrate their passion for energetic, historically-informed performance in this exploration of solo and trio sonatas by Arcangelo Corelli and his contemporaries. As the legendary Orpheus used his music as a rhetorical weapon, Corelli brought a new level of virtuosity and expression to violin playing. Corelli’s infectious harmonic and structural language took Europe by storm, but it was his older Roman compatriots, including Lelio Colista, Girolamo Frescobaldi, and Alessandro Stradella, who set the stage. The musical journey through the development of the trio sonata genre begins with sonatas and dances by Venetian composers, Dario Castello and Tarquinio Merula. After exploring trio sonatas by Roman composers including Giovanni Battista Fontana and Arcangelo Corelli, the program returns to Venice with the grand finale of Antonio Vivaldi’s Folia. As Italy, France, Germany, and England emerged as nations, so too rose their national musical styles. Each of these unique styles, however, was not isolated; porous musical boundaries created cosmopolitan stylistic unions. Arcangelo Corelli’s music exemplified the Italian sound, and François Couperin tried to merge Corelli’s style with his own French manner in Les Nations. In Germany, George Frederic Handel and Georg Philipp Telemann’s music incorporated elements of Italian and Polish traditions; in London, William Boyce was influenced by Handel. The concert concludes with the Sebastians signature rendition of Antonio Vivaldi’s Folia. Journey through the four seasons with Antonio Vivaldi’s most loved concerti, featuring the “fleet-fingered, passionate” (The New York Times) violinists of the Sebastians. The program also includes one of Georg Philipp Telemann’s concerti for four violins without continuo. For the tricentennial of the publication of Antonio Vivaldi’s L’Estro Armonico (1711), the Sebastians commissioned composer Robert Honstein to write a companion suite, which they premiered alongside Vivaldi’s work in December 2011. The suite received its New York premiere on November 13, 2013 at Columbia University’s Italian Academy. In a concert featuring chamber and orchestral works for winds, strings, and harpsichord, the Sebastians celebrate the 300th anniversary of Carl Philipp Emanuel Bach’s birth (1714) by juxtaposing his works with those of his father Johann Sebastian and brothers Johann Christian and Wilhelm Friedemann.